I first entered The Juilliard School as a piano student when I was 17 years old. Embarking on a life’s dream since childhood, I was on a journey to become a concert pianist. I did not really know what that meant, but I envisioned playing piano on stage, performing gorgeous music I loved, and wearing beautiful gowns. I wrote a paper in 11th grade about a fantasy concert where I performed a piano concerto with Leonard Bernstein and the New York Philharmonic. I think it was the Rachmaninoff 2nd Piano Concerto. I was unaware of the complexity of my career choice. Youthful enthusiasm and passion for music are powerful motivators. I auditioned and was accepted at Juilliard. I moved to New York from my small town in Virginia and began the one of the most momentous excursions of my life. Many years prior to beginning this adventure, I began playing a 24 key toy piano as a 4 year old child. I graduated to an upright piano when I began piano lessons at age 6. I remember when I was 11 years old, my mother bought a baby grand piano for me. I loved to practice. I loved music. I worked very hard. I listened to recordings endlessly – many by Leonard Bernstein and the New York Philharmonic. I got very nervous when I performed, but that was supposed to happen, wasn’t it? No one talked about it. I graduated from Juilliard with two degrees in piano performance. But while studying there, my stage fright (the nerves I had experienced long before enrolling) grew in proportion to my expanding musical piano repertoire. I did not understand my physical symptoms and self-doubts and I was able to perform well in public (paradoxically not with growing confidence to match my deepening skills). Other students did not talk about feeling anxious. Teachers did not talk about anxiety. I began to think I was the only person at Juilliard with stage fright. On February 13, 2018 I returned to my Alma Mater many years post graduation. I entered the School this time as a published author on the topic of stage fright. Unlike the scared high school graduate years earlier, I had become a more confident and experienced professional in mental health. I devoted my research, public presentations, and clinical work to studying and treating performance anxiety. My return to Juilliard as an author was heralded with posters of my book including a large photograph of myself in the widow and in the lobby. 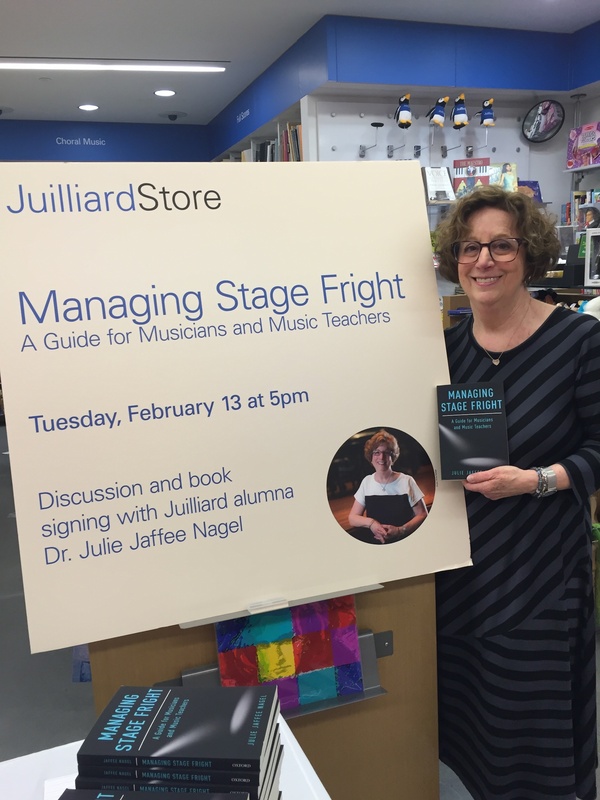 I was greeted warmly by staff, administrators, a welcoming post on the Juilliard Alumni Face Book page, and by many people who attended my book talk signing. Finally stage fright has come of age – a topic for discussion at my Alma Mater and elsewhere. 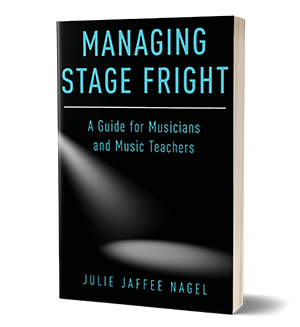 This time I was a different kind of soloist – author of “Managing Stage Fright: A Guide for Musicians and Music Teachers”. My goal in writing this book was as passionate as my youthful determination to become a concert pianist. I did not want performers (and this includes others besides musicians – speakers, writers, athletes, executives, physicians, psychologists, students, test-takers, and numerous others) to feel as isolated with their performance anxiety as I did with mine. I wanted others to gain knowledge about some origins of stage fright and some strategies to try, realizing that performance anxiety is a common problem, can be dealt with, and that one size does not fit all. I wanted others to feel it was normal to discuss how they felt. I wanted to share and give back what I had learned from my own music and psychological studies and lessons learned from my teachers and patients. I have taken several major journeys in my professional life. Each was embarked upon with enthusiasm and dedication. Now, each journey has modulated into informing the other – music teaching, performing, and using mental health resources are natural partners in contributing to healthy and well-rounded musicians. Returning to Juilliard this time felt like I was going “home”. Clearly my life’s work is very different from what I ever expected originally. I urge you to keep your options open – you never know how your life and career will turn out. Every current experience will fold into your next challenge and opportunity. Everything you do counts – although at a given time, you may not realize how. Each person creates a personal path with some detours, frustrations, but wonderful rewards. I wish all of you satisfaction, determination, fortitude, and pleasure taking your journey – or journeys. I would enjoy hearing about your itinerary. Please share a comment below, sign up for future blogs – or send me an e mail. Thank you so much for sharing your story – and your journey. It is never too late to pursue your dream, and I am honored to have been part of the encouragement to do that. No life experience is wasted. I wish you much pleasure as you continue to express yourself through your music. I was uplifted by your story Julie. Even though I’ve not had occasion to experience stage fright I can understand how it can be consuming. I do though experience a felling of being uninformed, unaware and sometimes even dumb for not being able to answer a question from a client even after I’ve researched it extensively. The Federal Government and the Medicare program baffles me and I’m so sorry for providers when they get caught in a situation where they’ve done everything they could and still do not get paid. I feel a personal loss for their revenue. So, I say the serenity prayer and hope for the best for all concerned. Thanks for the blog, I needed a break in my routine. Thank you for sharing your story – to feel so frustrated can lead to new solutions. Health care is more important today than ever and is more complicated than ever. You have so much to offer – keep helping others – Glad my blog offered a break in your routine – and to continue your good work.